There is a competition for the UK’s national bird. For England: A lion. Three lions passant adorn the Royal Arms of England after all. For Scotland: This too should be a lion. A lion rampant adorns the Royal Arms of Scotland after all. However, given the Scot’s fondness for the SNP and their enthusiasm for so called independence, the most appropriate choice would be a lemming. As words like “cliff” and “over” come to mind when one thinks of Nicola Sturgeon. For Wales: This too should be a lion, as the Royal Badge of Wales created in 2008 is blazoned quarterly Or and Gules, four lions passant guardant counterchanged. 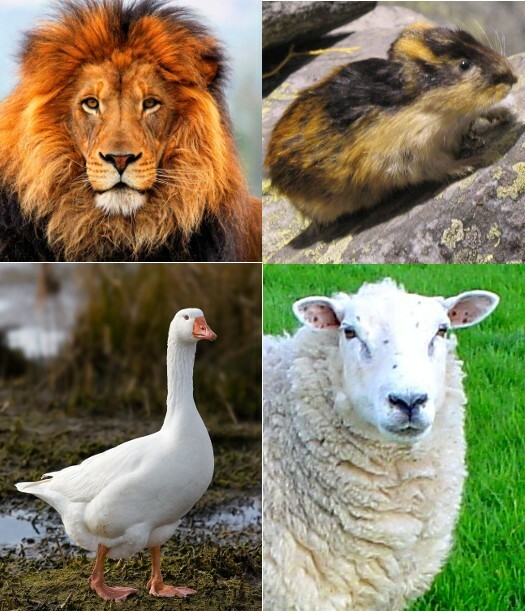 However, given the degree of tribalism with which the Welsh follow Labour, maybe the animal should be a sheep. After all, they have many of them. For Ireland: Well, the arms of Ireland feature a Harp and not an animal – these blazoned as, Azure a harp Or, stringed Argent. So that means we have to choose one. Now the Reader will have to bear with the Editor here as he is biased as his maternal grandmother was born in Crosshaven, County Cork. For Ireland the animal should indeed be a bird: A goose. Why? Because geese a wonderful fliers and the Irish literary creative genius through history can fly to the very heights of the human consciousness. For example from the ancient poets Adomnán and Flann Mainistrech through to Jonathan Swift and later W. B. Yeats. Geese are also highly territorial and they will defend their territory. They have a very nasty peck. Never pick a fight with an Irishman. So there you have it: Top Left, England, Top Right Scotland, Bottom Left, Ireland and Bottom Right, Wales. My concern is the damage she will do before going over that cliff.